Silk Roads: the Routes Network of Chang'an-Tianshan Corridor comprise a heritage route of some 5,000 km. The Tian-shan Corridor linked Chang'an in central China with the heartland of Central Asia. This is part of the major trade corridor that connected China with Europe. It took shape between the 2nd century BC and 1st century AD. It flourished between the 6th and 14th century AD. During my Grand Tour of China in 2007, I visited two stretches of this Silk Road nomination. In Xi'an, where there's a lot to see anyway, I saw the two Wild Goose Pagoda's. According to my notes, I found the Small one "rustic" and the Great one a bit tacky as it is located inside an amusement park. Both sites are well on the beaten track in Xi'an (maybe the city's best known sites next to the Terracotta Warriors), but I can't say it was a very memorable visit. Much more interesting was my detour to Gansu Province, in the far north west of China. After Dunhuang with its Mogao Caves, I rented a taxi for a day and the guy drove me around to all kinds of interesting places. Far, far out in the desert lie the remains of the Yumen Pass. It was very cold (November! ), and there were no other people around. Normally you would have to pay an entrance fee, but we were either too early in the day or too late in the season. The Yumen Pass was a former border post of the Han Empire. There's only one bulky structure left. As the temperature was around the freezing point, I just sprinted there to take some pictures and go back quickly to the warmth of the car. 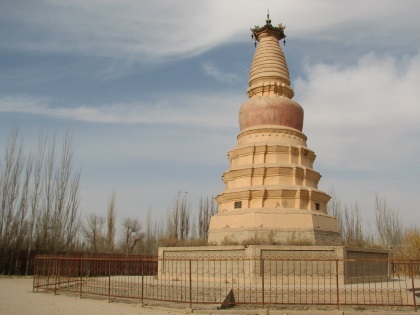 Between Dunhuang and the Yumen Pass lie several other Silk Road related structures: some are inscrbed and others not. A few original Great Wall remains and the ruins of the lost city Hecang (where fiercely barking dogs kept us outside), both inscribed with the Yumen section. And the Western Thousand Buddha Caves, a smaller version of the Mogao Caves, where there were dogs around there too. My driver bravely went on the lookout for the man with the key to open the caves, and succeeded so I could sightsee comfortably. There's also an Open Air Museum "Old Dunhuang" which is worth a look for its mud structures. Finally, on the outskirts of Dunhuang Town we visited the excellent White Horse Pagoda. This is a several times restored 4th century pagoda, 12m high. That such a beauty was left out of the list of core sites of this nomination, tells a lot of the high standard that was taken on the selection of the 33 final locations. As some others were described I will focus on less popular: Talgar (Kazakhstan) and Suyab - Ak Beshim (Kyrgyzstan), both visited in July, 2017. Talgar can be easily visited from Almaty town as a half-day trip. There is a convenient public bus from Sayakhat Bus Terminal (Avtovokzal Sayakhat) that goes directly to Talgar town (last bus stop). From town center there are around 3 km to the archeological excavations. From bus station cross the bridge and take the first main street to the right and follow the main road up the river. The place should be at the end of the street. Mind that there are no road-signs but at least local people know it and can direct you provided you know some Russian. In fact coordinates on our website are wrong as they show a place in the city center. Good coordinates are 43°16'47.1"N 77°13'19.0"E as they should show the the place called on Google Maps “Талгарское Городище” (Talgar Borough). Archeological remains covers relatively huge area although there is not much left apart from the reconstructed town gate (on the photo). There area is currently utilized as grazing ground for sheep, horses and cattle. Reconstructed town gate is interesting but during my visit it was closed (no information about opening hours). 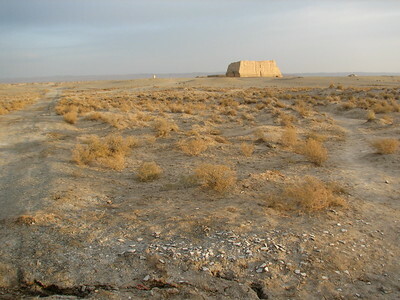 Suyab (Ak-Beshim) can be easily visited together with Burana as it is located some 12 km from the site. Moreover I was surprised that taxi drivers knows the place (and the way how to get). I guess that it is the onIn Tokmok (available from Bishkek by public transportation) it is possible to hire a taxi for a couple of hours to get to both places (Burana is by far more interesting so reserve much more time for it). 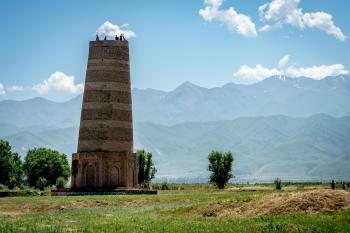 I visited the Burana Tower which is approximately 70km from the capital of Kyrgyzstan, Bishkek. 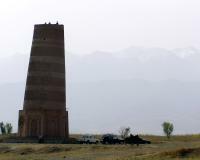 The Burana Tower was a stop on the silk road and served as both a minaret and an inland lighthouse for caravans. The site is very easy to visit and is right outside the town of Tokmok. Any taxi in town should be able to take you there. There is a small entry fee. In addition to the tower, there is a small cemetery with headstones with engraved images of the person who is buried. There is something mysterious about “Silk Roads” as there are few comparable sites that can capture an adventurous heart like Silk Roads can. With the reminiscences of ancient trading caravans, exotic arts and cultures, unfamiliar architecture of faraway land in the different side of the world, stories of Marco Polo and Xuanzang, or even the classical fantasy of Journey to the West, making Silk Roads not just a World Heritage Site but as the ideal representative of global cultural exchange that should be celebrated. Since the route networks differ throughout the long history and their different roles in each regional development, I am fine with the corridor approach. Among many ancient sites I have seen along the routes in Xi’an – Luoyang which were the capitals of China from Han to Tang Dynasties, only six places have been chosen by Chinese authority , Longmen Grottoes and Dingding Gate near Luoyang, Hangu Pass in Sanmenxia, and Xi’an’s Big and Small Wild Goose Pagodas and Weiyang Palace. For Luoyang, actually I expected that the famous White Horse Temple will be one of the selections, but thinking again that the temple actually is not quite authentic after Red Guard vandalism and the new development like Thai and Indian temples. The Han and Northern Wei ruins near the temple were not open for public yet during my visit, so I only focused on Tang and Sui part and the famous Longmen Grottoes. The Tang and Sui ruins are under the modern city of Luoyang, so even the authoritarian Chinese Government does not dare to relocate the whole city; they just built a modern museum hall and pagoda on the site that once was a Tang palace instead, so to be excluded from WHS is not a surprising matter. On the way back from Longmen Grottoes, I unknowingly visit the Dingding Gate which located next to the main road to city center. At that time I did not know what it was as the big gate was a recent reconstruction, my friend and I even thought it was a gate to cultural amusement park or nearby botanic garden. So apart from lovely Longmen, I was quite disappointed. On the way back to Xi’an, I stopped at Sanmenxia to see the famous Hangu Pass, I was not impressed with the reconstructed gate but it was better than Dingding, actually the nearby giant golden statue of Sage Laozi and Taoist garden were far more interesting in my idea as Hangu Pass has been considered a Taoist sacred site as Sage Laozi wrote the sacred Daodejing here. For Xi’an, I really impressed with the magnificent city wall and grand mosque, but these two structures are Ming Dynasty works, so to be excluded is understandable. There was nothing to see at Weiyang Palace, just a group of small dirt hills. 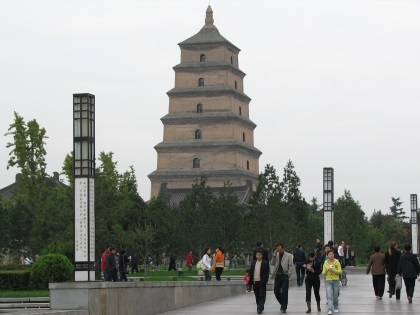 The highlight of Xi’an Silk Road sites for me is the Big Wild Goose Pagoda. The pagoda is pretty simple but amazing in its design on early Chinese adaptation of Indian Stupa like the one in Bodh Gaya. While I enjoyed the pagoda, the temple complex was horrendous with grand scale tourism development. The temple’s north plaza nightly fountains and light show was spectacular and made me feel like Paris’s Place de Chaillot and Eiffel Tower! 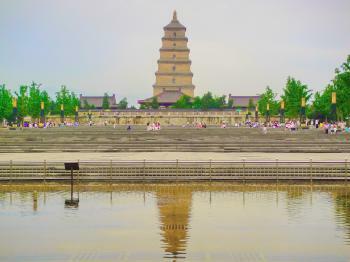 The Small Wild Goose Pagoda, in contrast, is located in the beautiful museum temple next to modern Xi’an Museum, its fountain is the epic version of Menneken Pis; the atmosphere here was more relaxed and quieter than the Big Wild Goose Pagoda. I climbed to the top of pagoda, not a comfortable experience and the view from the top was not good. Not part of a Silk Road nomination, I really liked the Silk Road Monument in front of the small replica Kaiyuan Gate in the western side of Xi’an. Some Chinese historian designated Kaiyaun Gate, the western gate of Chang’an during Tang Dynasty, as the starting point of the Silk Road. The sandstone monument of ancient trading caravan, in my opinion, can capture the spirit of the Silk Road very well. While I welcome Silk Roads to be inscribed as a World Heritage Site, I am afraid that the selected sites in Xi’an and Luoyang do not represent or give enough justice to the Silk Roads. Apart from Longmen Grottoes and Big and Small Wild Goose Pagodas where artistic design elements from outside China are clearly visible, I have not seen such direct cultural exchange in ruins of Weiyang Palace, Dingding Gate or Hangu Pass. These three sites may have important role in trade route and policy making, but there is nothing much left to see. Comparing with White Horse Temple and Xi’an Mosque, even though these sites have been rebuilt in later dynasties, these two sites can evoke the charm of Silk Road more than authentic Han and Tang ruins. In my opinion Silk Roads is a good concept of World Heritage Site and I would love to see other corridors in Central Asia, India or even European sites that directly represent the various cultural exchanges and development by Silk Roads to be inscribed in the future. I visited Xi'an in November 2013. My main objective was to visit the Terracotta Warriors sites. 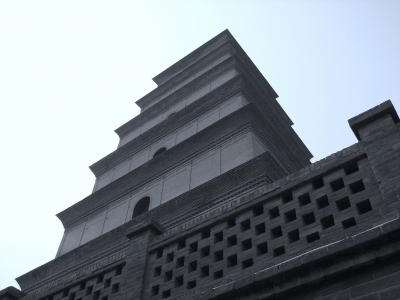 Knowing however that the ancient silk road actually begins at Chang'an (now Xian), I allowed a full day to visit the old city with its Big and Small Wild Goose Pagodas, the City Walls, the Bell Tower, the Drum Tower, etc. I enjoyed my time in Xi'an and would have loved to spend another night there. I hope that one day I'll be able to visit some other sites (in Kazakhistan for example) to be able to see the similarities or differences from the sites inscribed in China. Perusing the list of 33 sites included in this nomination one starts in the East with reasonably well known ones in Xian – the Wild Goose Pagodas and then on through 2 existing WHS at Longmen and Mogao and finally into the Tienshan area itself after which this part of the Silk Route has been named. And there is one in this group which I recognised – Burana in Kyrgyzstan! We visited this site back in 2004. It is situated around 70kms east of the capital Bishkek on the road to Lake Issyk Kul. Now. Kyrgyzstan is a place to visit primarily for its mountains and (at least in those days) the remains of its nomadic traditions – one highlight of our visit was to hear a Manaschi chanting the world’s longest epic poem (not the whole thing luckily as it extends to half a million lines!). Major historical sites are not the country’s strong point. Burana was a “stop off” visit therefore as much to break the morning’s drive to Issyk Kul as to see anything “remarkable”. And, in all honesty, what is on show isn’t that great – the stubby remains of a once much taller minaret now called the “Burana Tower” set against an attractive mountain background (photo). Constructed in brick, it has been heavily restored even at its reduced height. I was interested to note that the AB evaluation states “Minor repairs on the minaret at Burana were carried out in the 1970s using cement. The local authorities are now working to research appropriate repair materials similar to the originals in order to reverse this work”. Apart from a few mounds, this is about all that remains above ground of “the city of Balasagun (Site of Burana), the capital of the Eastern Kaganate of the Islamic Turkic state, is a planned Islamic medieval city of the 10th -14th century with a 24metre high minaret.” (AB). The AB also states that any excavations of the city itself have been back filled and certainly when we were there we gained no feeling for what else had been there beyond the ruined minaret. My memory of other extant remains is solely of a rather nice collection of “Balbals” – Kyrgyz anthropomorphic grave markers. Although the AB reports that there is an on-site museum and a good range of information boards, none of these were present in 2004. We climbed the tower through its spiral interior staircase and enjoyed the view of the mountains and the agriculture in this fertile valley and then made off to meet and talk to some Kyrgyz farmers who were wearing their attractive felt hats – and that was it! But with WHS you can never be sure. Who would have thought that, 10 years later, this site would have been deemed to possess OUV. 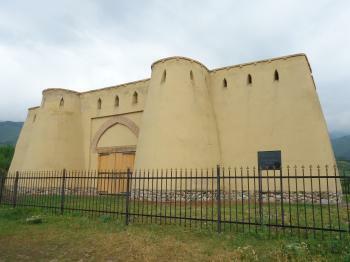 As the original T List entry for this site will be replaced on the UNESCO Web pages once the site is inscribed it might be worth commenting on the differences between it and the sites in Kyrgyzstan reviewed by ICOMOS as part of the Tien Shan Silk Road”. The T List contains 6 groups of sites. One, titled “Nomadic Monuments of Inner Tien Shan”, contains Tash Rabat reviewed by Jorge Sanchez below, together with Koshoi- Korgon, Manakeldy, Shyrdakbek and Kochkor. Others are “Sites of the Southern Issyk Kul” (Barskoon), “Medieval sites in the Upper Chui Valley: Navikat (Krasnaya Rechka), Suyab (Ak Beshim) and Balasagyn (Burana)”, “Cultural Environment of Manas Ordo” (the mausoleum thought to contain the remains of the Kyrgyz hero Manas – about whom the Manaschi sing), “Cultural Landscape of Safid Bulan” (Shakh Fazil mausoleum) and “Uzgen and Shorobashat sites”. But, from all of these, only 3 sites of the Upper Chui Valley have made it to the final nomination – obviously the others were not considered relevant for a “Silk Road” site. It will be interesting to see if Kyrgyzstan puts the others back into a new T List entry on a different basis. Xi'an is probably the starting point for visiting this massive WHS. How appropriate, because during the golden age of Tang Dynasty China, "All roads led to Chang'an." My visit took place in 2006 (early travels), and China was like nothing I had ever seen. I explored much of the city, but sadly I did not venture out to see the ruined Han or Tang palaces located outside modern-day Xi'an. What I do remember most is the massive "Great Wild Goose Pagoda". This tremendous structure dates back to 702 AD. Standing at 64 meters, the view from the top windows are stunning on a clear day (somewhat rare). 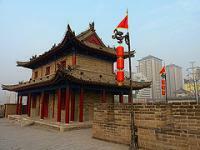 You can see all of Xi'an, including the extensive city wall, and the "Small Wild Goose Pagoda". Overall, my two days in Xi'an were unforgettable. Certainly, there are challenges, the city is on 24 hour construction mode. Which inevitably produces even more dust than what is already in the air. Traffic is jam packed, much of the historical sites lacked (at the time) English information. Nevertheless, these side factors did not prevent me from having a memorable and enjoyable experience. While I only saw a small (but key) portion of this "route", I am glad it began in Xi'an. For the future, I hope to visit more historical sites on the Silk Road. Hopefully, this transnational WHS expands West, East, and South with additional countries proposing sites on the Silk Road. 2.5: Alias65 Antonio J. Craig Harder Clyde Peter A. Includes the following former Chinese TWHS: The Remains of Chang'an City of the Han Dynasty, The Silk Road (Chinese Section), The Ruins of Daming Palace of the Tang Dynasty, The Ruins of Jiaohe Ancient City. And the former Kyrgyz TWHS: Burana-Minaret. No Nails: Xi'an Drum Tower: "there is no iron nail used anywhere in the Tower"
Destroyed or damaged by Earthquake: Burana Tower at Balasagun, "The last major earthquake in the 15th century destroyed the top half of the tower, reducing it to its current height of 25m"
Legends and Folk Myths: Burana Tower at Balasagun, "A legend connected with the tower says that a witch warned a local king that his newly-born daughter would die once she reached the age of eighteen. To protect her, he built a tall tower where he sequestered his daughter. No one entered the tower, except the daughter's servant who brought her food. The daughter grew up alone and became a beautiful young lady. One day, however, a poisonous spider was hiding in the food brought by the servant. The spider bit the girl, and she died in the tower, at the age of eighteen." Reduced from broader TWHS: Only a part of the Kyrgyz section of the transnational nomination was inscribed. The inscribed as well as uninscribed sections still appear as TWHS, probably as an extension.